This is the Country Club Cove Subdivision of Palm Coast. 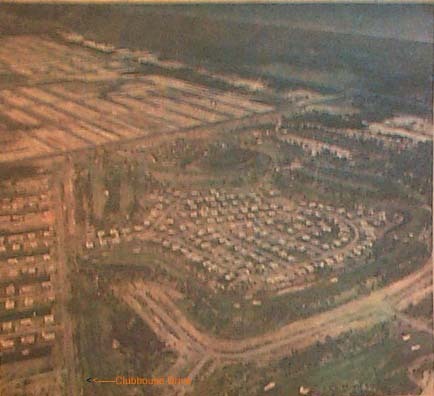 This is an Aerial View of the Island Grouping of the very first Neighborhood of homes in Palm Coast. 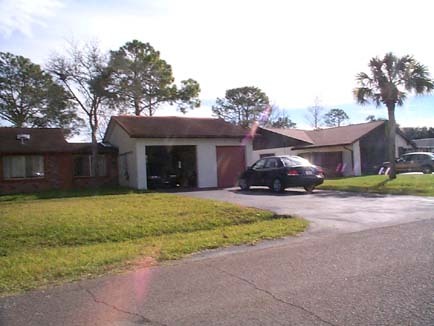 It was referred to by Realtors and others as the Core Area of homes. Clubhouse Drive is on the left and the Tour Vans entered via Casper Drive. 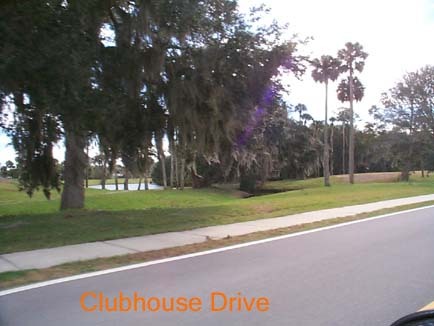 During the earliest Times, it was a designated construction site, thus only the Tour Vans were allowed here to view the 1st Neighborhood in Palm Coast - County Club Cove. Obviously, after the first residents started receiving their C.O. 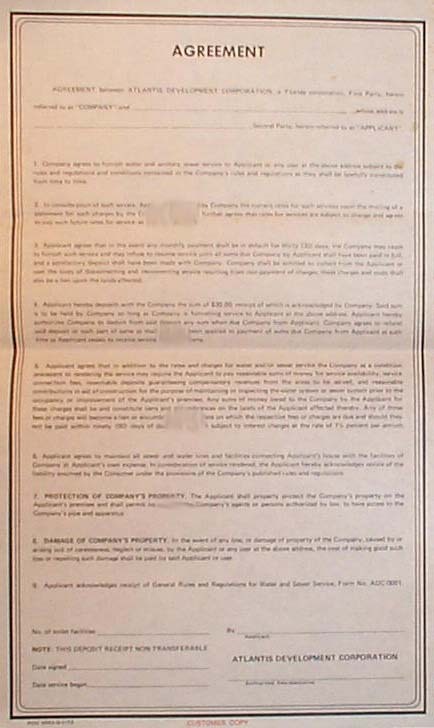 's ( Certificates of Occupancy) general traffic was permitted then along with the regular White and then also the Blue 9 passenger Tour Vans. Canals for the Golf Course drainage almost completely surround the Core Homes, further enhancing the 'Island Grouping' for these 1st Neighborhood grouping of homes. This is perhaps best seen in the Aerial View Above. 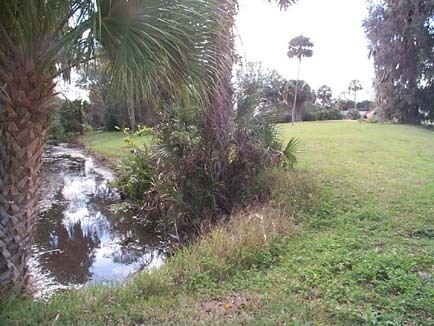 Another perspective of the Canals for drainage; above note the Core Homes, left to right, Cooper Lane and Casper Drive. To the extreme right, behind, would be the Golf Course 19th Hole Clubhouse and Parking lot. Another perspective from Clubhouse Drive showing the Retention Ponds and Canals further giving an 'Island Design' to the 1st Neighborhood. The Plan above shows the Entrance to the Golf Course via Clubhouse Drive to Casper Lane. The Streets were Casper Drive, Clark, Casper Court, Cooper Lane, Clark Lane , Cerrudo Lane, Carr Lane, Collins Lane, Cooper Court, and Carr Court. As the first homes were finished..the Tour of the streets and cul-de-sacs were expanded accordingly. 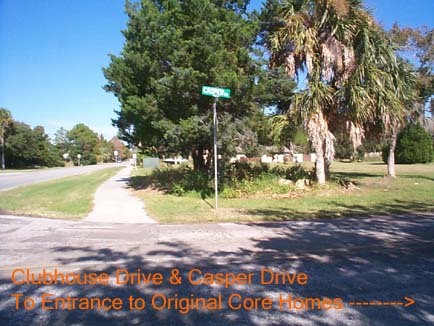 Initially, Casper Drive, loop towards where the 18th Hole was being constructed, back down towards Cooper Drive, past the First Child's and Neighborhood Park, right on Clark Lane back towards Casper Drive to the Entrance again. As the homes were being completed on the various other streets, the Tour expanded accordingly until all were finished and all streets became part of the 1st Neighborhood Loop. We do not know if there was any specific directions that had to be taken, we suspect that if it was a peak time, it was shortened accordingly; if it was a slow time then the time and length of the Tour was also adjusted accordingly. We saw them regularly go in both directions; both east and west. 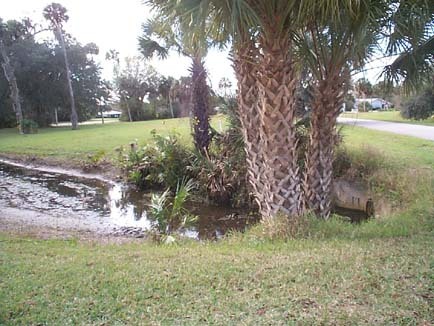 Directly behind this Casper Drive generic Sign, where the tall weeds, palm fronds, and vegetation now are, was a Large Sign Marker indicating it was the Palm Coast Golf Club Entrance. An entrance sign similar to this Sign existed at the entrance of Palm Coast Golf Course, later known as Palm Harbor Golf Course. The Entrance Sign was Cedar, Block and Mortar and was larger than this example. All 'Lots' in this area were 'Premium' with the Lots directly viewing the Golf Course the most expensive of the 'Premium'. Most persons that owned a Golf Cart stored them behind their Cars in the Carports. Those with two car garage stored them there. 1 Cerrudo Lane built this little Golf Cart Garage . It was a nice Element to have the choice of owning your own Golf Cart, especially, for those true Golf Enthusiasts. Whether it was for Golfing or to keep your dignity, mobility, and independence in advancing years, it was a great Element to have. 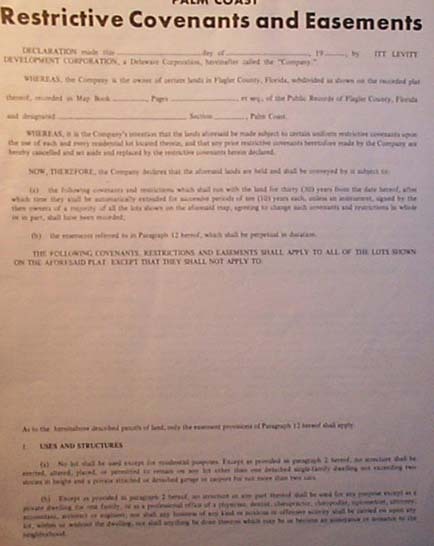 We hope this Element still remains for Future Visionary Residents of Palm Coast to have use of. 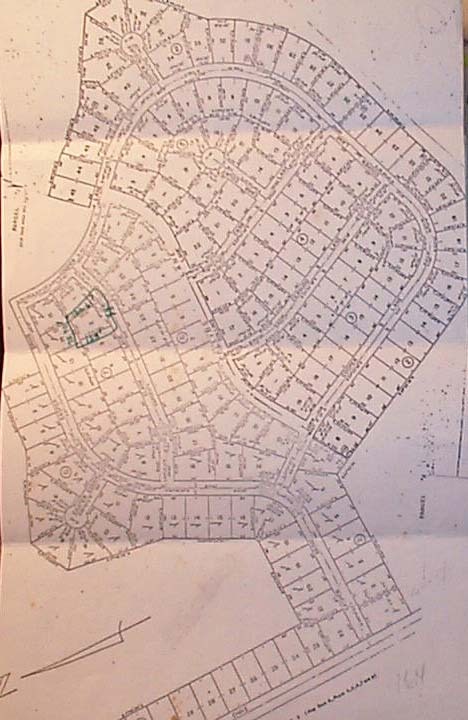 Homes in the Core Area - 'Country Club Cove' subdivision were protected by C.&R's. ( Covenants and Restrictions with Severability). 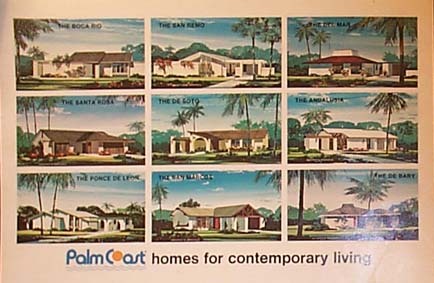 Homes here, in the Country Club Cove Section, the 1st Neighbood in Palm Coast, were a choice of eight of the nine Models. ( The San Marcos was discontinued; we believe there maybe a San Marcos located in the Florida Park area on Farragut and we think perhaps another San Marcos on Crompton Court. This one we think has been refurbished.). Each original 'Pioneer' had their choice of these models; except that there could not be Three of the same Model located together. We don't know about all that so perhaps Doctoral Candidates seeking their topics or Researchers can ascertain if there is any validity to this. ITT Levitt even furnished FREE each of the 164 homes with a garden hose and an impulse sprinkler. still no one ever said anything about all the traffic from the 'Guided Tour' vans of Prospective Buyers.. 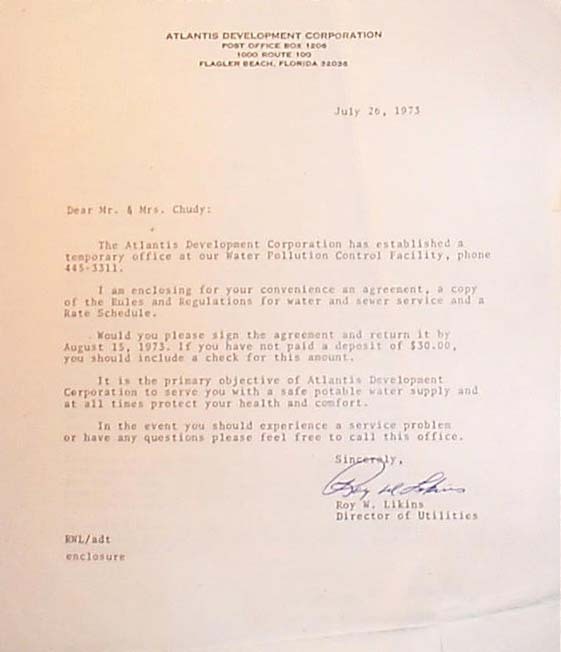 Above is a Copy of the Water and Sewer Agreement for the Atlantis Development Corporation. 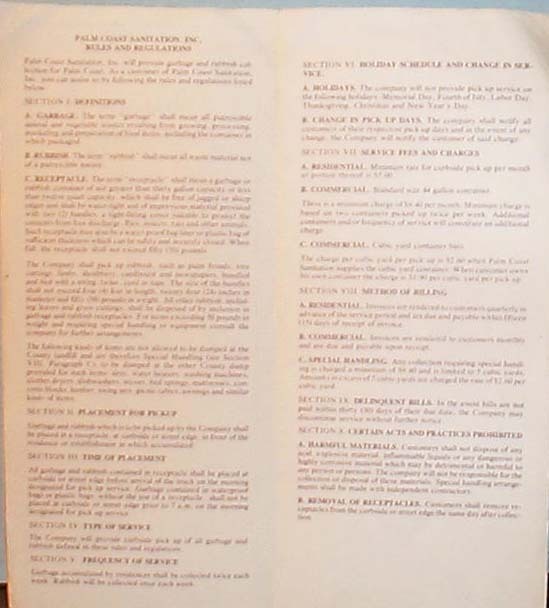 A copy of Palm Coast Sanitation Rules and Regulations. 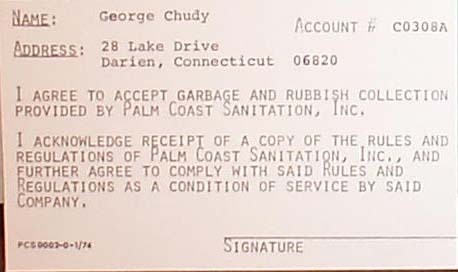 A copy of the Palm Coast Signature Card for service from the Palm Coast Sanitation, Inc., 5225 N.W. 87 Avenue, Miami Florida 33166. 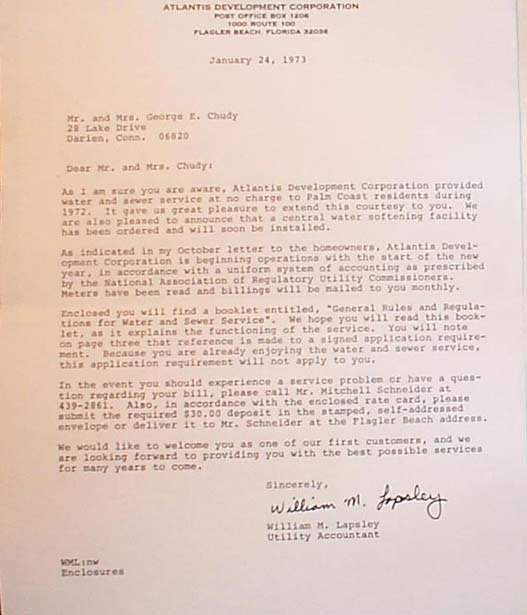 Consequently the 164 Homesites in the First Neighborhood of Palm Coast, Country Club Cove, received FREE Garbage and Rubbish Collection up to and including January 1974 for FREE. Again, we never heard anyone comment on all the many 'Guided Tour' Vans that ITT Levitt was shuttling in and around the first streets in the first Neighborhood. Two years of FREE Garbage and Rubbish ! That makes FREE Water and FREE Sewer and FREE Garbage and FREE Rubbish...for a very long time ! Thank you ITT Levitt!